The Puritans of Massachusetts Bay had their own reasons for setting up their colony. They sought as much uniformity of thought as possible, which is good in itself, but which also led to confrontations with those who disagreed with the leadership. 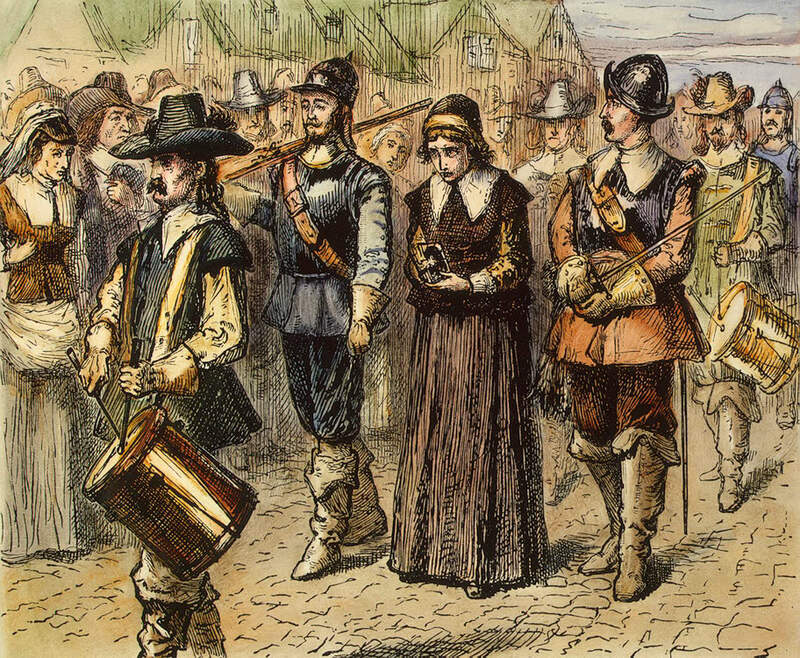 When Roger Williams and Anne Hutchinson went astray from the original vision, and their beliefs threatened the existence of the colony, they were banished. As I mentioned in previous posts, that punishment wasn’t all that severe; they simply wanted them to go away. In the 1650s, though, a new group came into being in England under the leadership of George Fox. The official name of the group was the Society of Friends, but they were commonly known as Quakers, a name given to them by their detractors after seeing them quake under the power of the Spirit in worship. Quaker doctrines didn’t mesh with those of the Puritans. 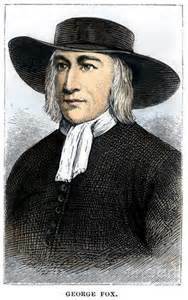 Quakers rejected both water baptism and communion, they would take no oaths (similar to Roger Williams), their Sunday meetings were unorganized as they sought to follow the leading of the Spirit, women were allowed to exhort and preach at the meetings (never allowed in Puritan churches), and they were pacifists, which meant they would not take up arms in self-defense if attacked. These early Quaker believers were imbued with an almost fanatical enthusiasm to convert everyone to their views. Some decided to emigrate to Massachusetts for that very purpose. They, in fact, intruded upon a society that had set up its own rules; often they were outright obnoxious. One famous (infamous?) incident occurred one Sunday morning when a Quaker woman interrupted a church service by striding down the aisle yelling at the worshipers, telling them their form of worship was rejected by God—naked worship, she called it—and created her own visual sermon by appearing stark naked herself. Needless to say, that was quite a disruption of the service. Massachusetts authorities told Quakers to leave, find someplace else to settle because their views weren’t welcome in a Puritan community. They refused. No matter how often they were banished, they returned. Finally, the frustration with Quaker obstinacy led the legislators to pass a law that included the death penalty for those who consistently returned after being banished. Four Quakers were found guilty and received the death sentence—three men and a woman. The sentence was carried out on the men, but the woman, Mary Dyer, was given a reprieve if she would leave and not come back. She came back. The sentence was carried out. It didn’t take long after this for the people of Massachusetts to recoil from what they had done. The death sentence for Quakers was repealed. They still weren’t welcome, though. If a Quaker refused to leave, he would be tied to an ox cart, whipped, and then taken to the next town for another whipping, etc., until set free at the border. The message was unmistakable—go away. How to judge these actions? First, the Puritans had every right to establish their own rules for living in their community. Second, the Quakers arrived for one reason only—to cause disturbances. Third, if Quakers really wanted to bring people into the Kingdom, why pick on Puritans who already were believers? Why not go to the natives in America instead? Fourth, the death penalty was definitely a step too far. It never should have been made law. Fortunately, it was repealed and never repeated after the one judgment. Fifth, we need to keep in mind that the Puritans shouldn’t be singled out for this. The established Anglican church back in England was treating Quakers the same way. This wasn’t a particular Puritan practice. It took decades before different denominations were able to coexist comfortably in Massachusetts (and in other colonies as well). And the Quakers? Well, they found a colony where they were not only welcome, but where they ran the government. But that’s a story for another day.